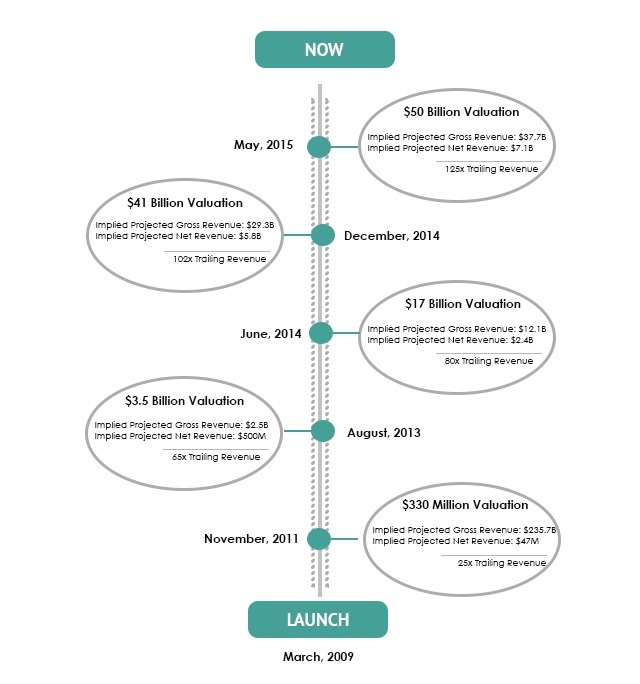 When it was first founded in 2009, Uber was valued at $2.8bn. In December 2014, we documented how Uber's valuation rose to $41.2bn, placing it neck in neck with some of America's bellwether corporations. Many mused over the crowd sourced ride-sharing company's hockey stick valuation trajectory and questioned of there was more left on the table. Then the world's most valuable tech startup, or startup of any kind for that matter, Uber's crown was promptly stolen by China's own version of Apple, Xiao Mi. Following the humble footsteps of Alibaba's founder Jack Ma, the little millet as it is known, quickly gain the attention of stardom. Sensationalism and bombast promptly ensued. The world's fourth largest maker of mobile phones had rose to become the world's highest valued privately held company of its kind. With a $46bn price tag, observers ruminated if anything could surpass that in 2015. It took just 3 weeks, 3 weeks after private investors announced their dictation of Uber's $41.2bn price tag, for that record to be smashed with a $4.6bn mallet. If you haven't already read our story on Xiao Mi's stellar ascent, we still feel that Xiao Mi holds more ground than Uber does; whatever that actually means. But back to the question of how stratospheric the numerics can rise to, we suggest not holding your breaths. Even before the business community could say "Uber Bubblicious" without twisting their tongues, they got an answer. At $50bn, Uber will be worth almost as much as the food conglomerate Kraft ($50.9bn); Target ($51.6bn), one of America's largest retailers; and Caterpillar ($52.7bn), the world's largest manufacturer of farming machinery. Should Uber receive its $1.5bn - $2bn in funding, it will be worth more than bellwethers the likes of FedEx ($49.2bn); Merck ($48.9bn); Yahoo ($41.4bn); and Emerson ($39.3bn). 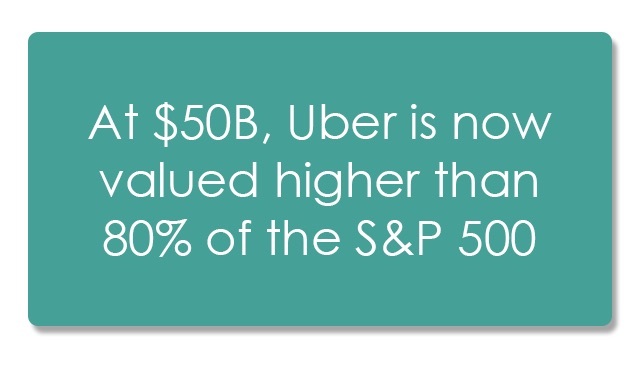 Collectively, Uber will be valued higher than 80% of the 500 companies of the S&P 500 Index. The news was announced by the company earlier in May, and was greeted with polarized reactions which ranged from outright amazement to a ludicrous circle jerking joke of the decade. If indeed Uber secures that bout of additional funding, it will officially become the world most capitalized privately held business, on top of having the baddest eye-watering valuation out there. We at Business Of Finance are natural skeptics of the accounting wizardry and phony math which, more often than not, obfuscates rather than clarifies the fair value of startups, and which billion-dollar tech startups are so fond of; especially those that thrive on a brazen cult of personalities. By eschewing reality from fiction, anyone can cook up numbers of fairies and unicorns on their inconspicuous books. We are therefore left with little else to comment on but to note that the transition from private startup to public company is often not a smooth one. Elon Musk's Tesla saw its dotcom-esque rally after it went public, and not before. It looks as if companies like Uber breed and bud in mirror opposite of Musk's genius. When the house of cards does collapse on the absence of anything concrete, we wish these startups the best mazing through utter pandemonium they have bestowed upon themselves. We will leave readers with some anecdotes to ponder over while taking a dab at some plausible math that might explain how Uber can remotely be worth $50bn. Of all the so-called Unicorns (companies with valuations of at least $1 billion), Uber stands out above the rest. It currently holds the distinction of being the world’s most highly capitalized startup and its growth appears to be accelerating at breakneck speed. Still, when I saw the news that Uber plans to raise another $1.5 to $2.0 billion at a staggering $50 billion valuation, I was shocked. I couldn’t help but wonder what that really meant for the company. In order to better understand what was going, my team and I dug into the numbers. First and foremost, Uber’s only real exit strategy at this point is to go public. That won’t pose problems for them in the near-term, but it may cause problems in the future. After all, Wall Street is notoriously short on both patience and understanding. It’s likely that when Uber goes public, it will be at a valuation of $70 billion or more. At that point, unless their revenue has increased dramatically, they’re going to have to deliver on even more accelerated growth annually over the next five years. With increasing pressure from both the incumbent players and local governments, achieving this growth could be a tall order. While very few companies will ever find themselves in Uber’s enviable position, each and every entrepreneur eventually has to grapple with establishing a value for their business. When that time comes, they have to decide whether to push forward with a high value and its implied growth, or take a more conservative route. The market is strewn with the corpses of companies that have reached for high values and failed in execution. Consider the stories of Zynga, Webvan, or Groupon. All of these businesses saw incredible growth and high valuations, only to be brought down by the harsh realities of not meeting the public market’s expectations. That’s why my co-founder and I opted for a conservative valuation during our last fundraising round at BodeTree. It was a difficult decision, but ultimately we chose to settle on a value that captured the immense opportunity that was ahead of us, yet was still tempered by conservative assumptions. In the end, we settled for a value that we thought was more reasonable than what the market might have supported. Our rationale was simple. If we had raised the round at the highest valuation possible like Uber, we would have committed ourselves to delivering even more growth in the near-term in order to justify the value. It’s likely that we would not have been able to remain focused on our long-term vision. We felt strongly that giving ourselves the room to do what was right for the company – and avoid the pressure to grow at all costs – was the best path. And today, we have no regrets.